Megatherium was a giant ground sloth. That from the late Pliocene epoch to the early Holocene, between about 2 million and 8,000 years ago. It is believed to have gone extinct as a result of hunting by humans. Megatherium weighed around 5 tons, and was 20 feet (6 meters) tall when standing on its hind limbs. 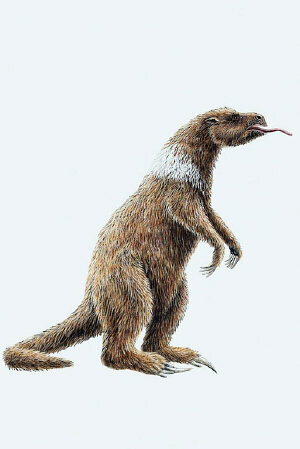 It is believed to have stood on its hind legs, using its tail for support as a tripod, and used its front limbs to pull down branches from which it would have eaten leaves. It was probably also equpped with a long tongue. Megatherium probably most ate leaves, but may also have hunted or scavenged meat as well - there is for eaxmple, some suggestion that it could have used its claws as daggers. One possibility is that Megatherium could have scavenged kills made by Smilodon. Another possibility is that Megatherium may have hunted Glyptodonts - a number of fossils of Glyptodonts have been showing the creature apparently dying on its back, and the only creature in the habitat that could have flipped over a Glyptodont, is Megatherium. Megatherium was one of the biggest ground sloths that ever existed. This 'great beast' weighed between 3 and 4 tons and was enormous compared to its modern-day relatives, the tree sloths. Read Megatherium to find out more about this huge creature, as well as to learn interesting facts about other ancient ground sloths. How did Europeans three centuries apart respond to two mysterious beasts—a living rhinoceros previously known only from ancient texts and a nameless monster’s massive bones? Juan Pimentel shows that their reactions reflect deep cultural changes but also the enduring power of image and imagination to shape our understanding of the natural world. I had been honored by an invitation from the National Institute, established at Washington, to read a paper before that body, on some subject con nected with the progress of science. Having accept ed that invitation, I was placed in the position of the traveller who had requested an interview with Mohammed Ali, the Pacha of Egypt. The traveller, not having previously arranged a subject of conver sation to be held with His Highness, was at fault, during his audience. Say something! Was the Viceroy's indulgent suggestion. There was, how ever, a high administrative import in that suggestion. The wonderful organic remains which crowd and underlie the recent formation of the coast of Geor gia, seemed to me a proper subject for this occasion, as one about which something might be said. Memoir on the Megatherium - Or, Giant Ground-Sloth of America is an unchanged, high-quality reprint of the original edition of 1861. Hansebooks is editor of the literature on different topic areas such as research and science, travel and expeditions, cooking and nutrition, medicine, and other genres. As a publisher we focus on the preservation of historical literature. Many works of historical writers and scientists are available today as antiques only. Hansebooks newly publishes these books and contributes to the preservation of literature which has become rare and historical knowledge for the future. When novice climbers Trevor and Gaspar attempt Mount Silenus they discover that inspiration from a mythic book makes a poor substitute for experience. Accuracy is important on mountains, especially one darkened by legends of a prehistoric sloth -- the Abominable Unau -- and the indigenous people who make sacrifices to it. As the text bears less and less resemblance to the terrain, squabbles over its interpretation become a battle of faith vs. reason. Those are best fought on flat surfaces. Why does a man climb a mountain? To taste the distilled essence of life, to glimpse the clandestine maneuvers of his soul, and because he believes everything he reads. For two high school teachers who skipped their climbing classes, a masterpiece advocating spontaneity over skill proves irresistible. Unknown to them, the reclusive author honed his technique scaling barstools and brooding over the unjust fame of Nietzsche. He ignored eyewitness accounts of the Abominable Unau for stylistic reasons. Stories about wrathful apparitions infesting a labyrinth of caves didn't make the cut either. During a quixotic journey in the general direction of the summit, Trevor and Gaspar join a scientist investigating paranormal activity on one of the plateaus. The book fails to warn about traps set by the mountain people to protect the sacred site from desecration. When they fall into icy catacombs they must confront the source of the legends to survive. Inspired by a disastrous attempt on Denali.